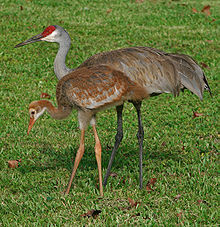 The sandhill crane (Antigone canadensis) is a species of large crane of North America and extreme northeastern Siberia. The common name of this bird refers to habitat like that at the Platte River, on the edge of Nebraska's Sandhills on the American Plains. This is the most important stopover area for the nominotypical subspecies, the lesser sandhill crane (Antigone canadensis canadensis), with up to 450,000 of these birds migrating through annually. An immature Florida sandhill crane walks along the shore of Lake Cecile near Kissimmee, Florida. The sandhill crane was formerly placed in the genus Grus, but a molecular phylogenetic study published in 2010 found that the genus, as then defined, was polyphyletic. In the resulting rearrangement to create monophyletic genera, four species, including the sandhill crane, were placed in the resurrected genus Antigone that had originally been erected by the German naturalist Ludwig Reichenbach in 1853. The specific epithet canadensis is the modern Latin word for "Canadian". Adults are gray overall; during breeding, their plumage is usually much worn and stained, particularly in the migratory populations, and looks nearly ochre. The average weight of the larger males is 4.57 kg (10.1 lb), while the average weight of females is 4.02 kg (8.9 lb), with a range of 2.7 to 6.7 kg (6.0 to 14.8 lb) across the subspecies. Sandhill cranes have red foreheads, white cheeks, and long, dark, pointed bills. In flight, their long, dark legs trail behind, and their long necks keep straight. Immature birds have reddish-brown upperparts and gray underparts. The sexes look alike. Sizes vary among the different subspecies; the average height of these birds is around 80 to 136 cm (2 ft 7 in to 4 ft 6 in). Their wing chords are typically 41.8–60 cm (16.5–23.6 in), tails are 10–26.4 cm (3.9–10.4 in), the exposed culmens are 6.9–16 cm (2.7–6.3 in) long, and the tarsi measure 15.5–26.6 cm (6.1–10.5 in). These cranes frequently give a loud, trumpeting call that suggests a rolled "r" in the throat, and they can be heard from a long distance. Mated pairs of cranes engage in "unison calling". The cranes stand close together, calling in a synchronized and complex duet. The female makes two calls for every one from the male. Sandhill cranes' large wingspans, typically 1.65 to 2.30 m (5 ft 5 in to 7 ft 7 in), make them very skilled soaring birds, similar in style to hawks and eagles. Using thermals to obtain lift, they can stay aloft for many hours, requiring only occasional flapping of their wings, thus expending little energy. Migratory flocks contain hundreds of birds, and can create clear outlines of the normally invisible rising columns of air (thermals) they ride. Sandhill cranes fly south for the winter. In their wintering areas, they form flocks over 10,000. One place this happens is at Bosque del Apache National Wildlife Refuge, 100 mi (160 km) south of Albuquerque, New Mexico. An annual Sandhill Crane Festival is held there in November. Sandhill cranes have one of the longest fossil histories of any extant bird. A 10-million-year-old crane fossil from Nebraska is said to be of this species, but this may be from a prehistoric relative or the direct ancestor of sandhill cranes and not belong in the genus Grus. The oldest unequivocal sandhill crane fossil is 2.5 million years old, older by half than the earliest remains of most living species of birds, primarily found from after the Pliocene/Pleistocene boundary some 1.8 million years ago. As these ancient sandhill cranes varied as much in size as present-day birds, those Pliocene fossils are sometimes described as new species. Grus haydeni may have been a prehistoric relative, or it may comprise material of a sandhill crane and its ancestor. Sandhill cranes vary considerably in size (much of which is clinal) and in migratory habits. A female of A. c. canadensis averages 3.46 kg (7.6 lb), 37 in (94 cm) in length, and has a wingspan of 1.6 m (5 ft 3 in). A male of A. c. tabida averages 5 kg (11 lb), 119 cm (47 in) in length, and has a wingspan of 2.12 m (6 ft 11 in). The southern subspecies (along with A. c. rowani) are intermediate, roughly according to Bergmann's rule. Three subspecies are resident: A. c. pulla of the Gulf Coast of the U.S., A. c. pratensis of Florida and Georgia, and A. c. nesiotes of Cuba. The northern populations exist as fragmented remains in the contiguous U.S. and a large and contiguous population from Canada to Beringia. These migrate to the southwestern United States and Mexico. These cranes are rare vagrants to China, South Korea, and Japan and very rare vagrants to Western Europe. The Florida sandhill crane was listed as EC or easily confused to facilitate an attempted reintroduction of the whooping crane (Grus americana) into Florida. The attempt failed, but the listing remained. The current list of endangered subspecies includes only two birds, A. c. nesiotes and A. c. rowani, with A. c. pratensis no longer listed. The Canadian sandhill cranes are not distinct and were never accepted as a valid subspecies. The others can be somewhat more reliably distinguished in hand by measurements and plumage details, apart from the size differences already mentioned. Unequivocal identification often requires location information, which is often impossible in migrating birds. Analysis of control region mtDNA haplotype data shows two major lineages. The Arctic and the subarctic migratory population includes the lesser sandhill cranes. The other lineages can be divided into a migratory and some indistinct clusters which can be matched to the resident subspecies. The lesser and greater sandhill cranes are quite distinct, their divergence dating to roughly 2.3–1.2 million years ago , some time during the Late Pliocene or Early Pleistocene. Glaciation seemingly fragmented off a founder population of lesser sandhill cranes, because during each major ice age, its present breeding range was frozen year-round. Still, sandhill cranes are amply documented from fossil and subfossil remains right to the modern era. Conceivably, they might be considered distinct species already, a monotypic G. canadensis and the greater sandhill crane, G. pratensis, which would include the other populations. It appears as if the scant differences between southern Canadian and western U.S. populations result from genetic drift, due to the recent reduction in population and range fragmentation. Until the early 20th century, the southern migratory birds occupied a much larger and continuous range. Thus, the subspecies A. c. rowani may well be abandoned. The two southern U.S. resident populations are somewhat more distinct. The Cuban population has been comparatively little studied, but appears to have been established on the island for a long time. They and the migratory greater sandhill cranes proper may form a group of lineages that diverged much later from a range in the southern U.S. and maybe northern Mexico, where they were resident. The southern migratory population would then represent a later re-expansion, which (re-)evolved their migratory habits independent from the northernmost birds, the geographically separated populations expanding rapidly when more habitat was available as the last ice age ended. Sandhill cranes are mainly herbivorous, but eat various types of food, depending on availability. They often feed with their bills down to the ground as they root around for seeds and other foods, in shallow wetlands with vegetation or various upland habitats. Cranes readily eat cultivated foods such as corn, wheat, cottonseed, and sorghum. Waste corn is useful to cranes preparing for migration, providing them with nutrients for the long journey. Among northern races of sandhill cranes, the diet is most varied, especially among breeding birds. They variously feed on berries, small mammals, insects, snails, reptiles, and amphibians. Sandhill cranes raise one brood per year. In nonmigratory populations, laying begins between December and August. In migratory populations, laying usually begins in April or May. Both members of a breeding pair build the nest using plant material from the surrounding area. Nest sites are usually marshes, bogs, or swales, though occasionally on dry land. Females lay one to three (usually two) oval, dull brown eggs with reddish markings. Both parents incubate the eggs for about 30 days. The chicks are precocial; they hatch covered in down, with their eyes open, and able to leave the nest within a day. The parents brood the chicks for up to three weeks after hatching, feeding them intensively for the first few weeks, then gradually less frequently until they reach independence at 9 to 10 months old. A baby Mississippi sandhill crane is weighed at White Oak Conservation. The chicks remain with their parents until one to two months before the parents lay the next clutch of eggs the following year, remaining with them 10–12 months. After leaving their parents, the chicks form nomadic flocks with other juveniles and nonbreeders. They remain in these flocks until they form breeding pairs at between two and seven years old. As a conspicuous ground-dwelling species, sandhill cranes are at risk from predators, which are probably the main nonanthropogenic source of mortality. Mammals such as foxes, raccoons, coyotes, wolves, cougars, bobcats, and lynx hunt them given any opportunity, the first three mainly hunting large numbers of young cranes, the latter four types more rarely taking full-grown cranes in ambush excepting the prolific bobcat. Corvids, such as ravens and crows, gulls, and smaller raptors such as hawks (largely northern harriers or red-tailed hawks) feed on young cranes and eggs. Cranes of all ages are hunted by both North American species of eagles. Mainly chicks and possibly a few adults may be preyed on by great horned owls and even the much smaller peregrine falcons has successfully killed a 3.1 kg (6.8 lb) adult sandhill crane in a stoop. In Oregon and California, the most serious predators of flighted juveniles and adults has been cited as golden eagles and bobcats, the most serious predators of chicks are reportedly coyotes, ravens, raccoons, American mink, and great horned owls in rough descending order. In Cuba and Florida, the American crocodile and alligator can take a surprisingly large number of sandhill cranes, especially recent fledglings. Sandhill cranes defend themselves and their young from aerial predators by jumping and kicking. Actively brooding adults are more likely to react aggressively to potential predators to defend their chicks than wintering birds, which most often normally try to evade attacks on foot or in flight. For land predators, they move forward, often hissing, with their wings open and bills pointed. If the predator persists, the crane stabs with its bill (which is powerful enough to pierce the skull of a small carnivore) and kicks. 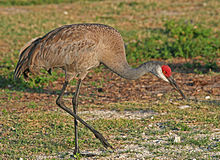 Although sandhill cranes are not considered threatened as a species, the three southernmost subspecies are quite rare. Resident populations, not migratory birds, cannot choose secure breeding habitat. Many subpopulations were destroyed by hunting or habitat change. The greater sandhill crane proper initially suffered most; by 1940, probably fewer than 1,000 birds remained. Populations have since increased greatly again. At nearly 100,000, they are still fewer than the lesser sandhill crane, which, at about 400,000 individuals, is the most plentiful crane alive today. Some migratory populations of sandhill cranes face population threats due to interspecies competition with snow geese. Since the 1990s, snow geese have eaten waste corn on which the cranes also rely prior to migration. Despite this competition and other pressures, since the early 2000s the sandhill crane has expanded both its winter (non-breeding) and breeding ranges northward, including into upstate New York. In the 21st century, parts of the Midwestern United States have seen an extensive rebound of the species. The Florida sandhill crane is far less common, with some 5,000 remaining. They are most threatened by habitat destruction. In Florida, they are protected by high monetary penalties for killing them, under state and federal law. The transplantation of wild birds and introduction of captive-reared birds into suitable low-population areas have been called a viable management technique. The Mississippi sandhill crane has lost the most range; it used to live along most of the northern Gulf of Mexico coast, and its range was once nearly parapatric with that of its eastern neighbor. As of 2013, about 25 breeding pairs exist in an intensively managed population. The Mississippi Sandhill Crane National Wildlife Refuge—established in 1975 when fewer than 35 of the birds existed—has the biggest release program for cranes on Earth, and 90% of the cranes there were raised in captivity. The second viable egg from a two-egg nest was occasionally removed from the nests, starting in 1965, to become part of a captive flock. This breeding flock is divided between the Audubon Institute's Species Survival Center and White Oak Conservation in Yulee, Florida. These cranes have produced offspring for annual releases into the refuge. A Mississippi sandhill crane was the first bird to hatch from an egg fertilized by sperm that was thawed from a cryogenic state. This occurred at the Audubon Institute, as part of this subspecies' endangered species recovery plan. About 300 Cuban sandhill cranes exist; this is the least known of the populations. In January 2019, 25 to 30 thousand Cranes (both Greater and Lesser subspecies) were found wintering at the Whitewater Draw State Wildlife Area near McNeal in southeast Arizona. Sandhill cranes have been tried as foster parents for whooping cranes in reintroduction schemes. This failed when the whooping cranes imprinted on their foster parents, later did not recognize other whooping cranes as their conspecifics, and unsuccessfully tried to pair with sandhill cranes instead. Sandhill cranes occasionally reach Europe as vagrants. The first British record was on Fair Isle in April 1981, and the second was in Shetland in 1991. Small groups of sandhill cranes have also been seen in parts of eastern China. ^ BirdLife International (2016). "Antigone canadensis". The IUCN Red List of Threatened Species. IUCN. 2016: e.T22692078A93336581. doi:10.2305/IUCN.UK.2016-3.RLTS.T22692078A93336581.en. Retrieved 15 January 2018. ^ Krajewski, C.; Sipiorski, J.T. ; Anderson, F.E. (2010). "Mitochondrial genome sequences and the phylogeny of cranes (Gruiformes: Gruidae)". Auk. 127 (2): 440–452. doi:10.1525/auk.2009.09045. ^ Gill, Frank; Donsker, David, eds. (2017). "Rails, gallinules, trumpeters & cranes". World Bird List Version 7.2. International Ornithologists' Union. Retrieved 28 June 2017. ^ Reichenbach, Ludwig (1853). Reichenbach Handbuch der speciellen Ornithologie. Leipzig: Friedrich Hofmeister. p. xxiii. ^ Jobling, James A (2010). The Helm Dictionary of Scientific Bird Names. London: Christopher Helm. p. 87. ISBN 978-1-4081-2501-4. ^ CRC Handbook of Avian Body Masses, John B. Dunning, Jr. (ed.). CRC Press (1992), ISBN 978-0-8493-4258-5. ^ Sandhill Crane. Allaboutbirds.org. Retrieved on 2012-12-30. ^ Sandhill Crane. Seattleaudubon.org. Retrieved on 2012-12-30. ^ a b Dunn, J.L. & Alderfer, J., editors. Field Guide to the Birds of North America. National Geographic, Washington, D.C.
^ The Nature Conservancy: Sandhill Crane Archived 17 November 2010 at the Wayback Machine. Retrieved 2008-JAN-16. 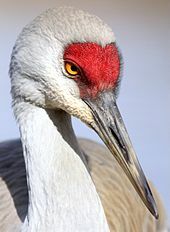 ^ Volz, Becky Lauren (2003): The Biogeography of the Sandhill Crane (Grus canadensis) Archived 18 January 2008 at Wikiwix. Version of 2003-DEC-31. ^ Miller, Loye H. (1944). "Some Pliocene birds from Oregon and Idaho" (PDF). Condor. 46 (1): 25–32. doi:10.2307/1364248. ^ Miller, Alden H. & Sibley, Charles Gald (1942). "A New Species of Crane from the Pliocene of California" (PDF). Condor. 44 (3): 126–127. doi:10.2307/1364260. ^ a b Brodkorb, Pierce (1967). "Catalogue of Fossil Birds: Part 3 (Ralliformes, Ichthyornithiformes, Charadriiformes)". Bulletin of the Florida State Museum. 11 (3): 99–220. ^ a b c d e f Rhymer, Judith M.; Fain, Matthew G.; Austin, Jane E.; Johnson, Douglas H. & Krajewski, Carey (2001). "Mitochondrial phylogeography, subspecific taxonomy, and conservation genetics of sandhill cranes (Grus canadensis; Aves: Gruidae)" (PDF). Conservation Genetics. 2 (3): 203–218. doi:10.1023/A:1012203532300. Archived from the original (PDF) on 20 February 2012. Retrieved 9 December 2018. ^ a b Johnsgard PA. (2011) Sandhill and Whooping Cranes: Ancient Voices over America's Wetlands, University of Nebraska Press: Lincoln, ISBN 0803234961. ^ a b Walkinshaw, L. H. 1949. The Sandhill Cranes. Cranbrook Inst. Sci. Bull. 29. Bloomfield Hills, MI. ^ a b Walkinshaw, L. H. 1973. Cranes of the world. Winchester Press, New York. ^ Littlefield, C. D. (1995). Sandhill crane nesting habitat, egg predators, and predator history on Malheur National Wildlife Refuge, Oregon. Northwestern Naturalist, 137–143. ^ Littlefield, C. D., & Lindstedt, S. M. (1992). Survival of juvenile greater sandhill cranes at Malheur National Wildlife Refuge, Oregon. ^ Drewien, R. C. (1973). Ecology of Rocky Mountain greater sandhill cranes. ^ Harris, M. (2000). "Grus canadensis". Animal Diversity Web. Animaldiversity.ummz.umich.edu. ^ Pearse AT; Krapu GL; Brandt DA; Kinzel PJ (2010). "Changes in Agriculture and Abundance of Snow Geese Affect Carrying Capacity of Sandhill Cranes in Nebraska". Journal of Wildlife Management. 74 (3): 479–488. doi:10.2193/2008-539. ^ "113th CBC New York Regional Summary". National Audubon Society. Retrieved 2017-02-22. ^ "Sandhill Cranes Successfully Nest in the Adirondacks". Tupper Lake. Retrieved 2017-02-22. ^ O'Connell, Patrick M. "Sandhill cranes bounce back from brink as migration over Illinois to peak next week". chicagotribune.com. Retrieved 2017-11-21. ^ Stys, B. (1994): Ecology and habitat protection needs of Florida sandhill cranes on areas proposed for land conversion activities. Florida Game and Fresh Water Fish Commission. Nongame Wildlife Program Technical Report No. 14. Tallahassee, FL. ^ "Mississippi Sandhill Crane". Retrieved 21 June 2013. ^ "Crane Population Management". Mississippi Sandhill Crane National Wildlife Refuge. Retrieved 21 June 2013. ^ Riddiford, Nick (1983). "Sandhill Crane: new to Britain". British Birds. 76 (3): 105–109. ^ Ellis, Pete (1991). "The Sandhill Crane in Shetland". Birding World. 4 (9): 322–323. ^ "Sandhill cranes seen in E China's Jiangsu". Xinhuanet. 12 February 2012. Retrieved 2013-05-18. Meine, Curt D. & Archibald, George W. (eds.) (1996). Sandhill Crane (Grus canadensis). In: The cranes: – Status survey and conservation action plan. IUCN, Gland, Switzerland, and Cambridge, U.K.
Wikimedia Commons has media related to Sandhill crane. Wikisource has the text of the 1905 New International Encyclopedia article Sand-hill Crane. "Sandhill crane media". Internet Bird Collection.